This winter, the Neighbourhood Cinema gets into the festive spirit with screenings of Christmas classics on a Frozen Island. Visitors are invited to voyage to the shores of an enchanted frozen island to find a shipwrecked world surrounded by frosted palm trees, icicles and giant snow globes. Once there, they'll be able to snuggle down to enjoy festive favourites such as Elf, The Santa Clause and Home Alone or cult classics like Die Hard, The Beach and Edward Scissorhands. 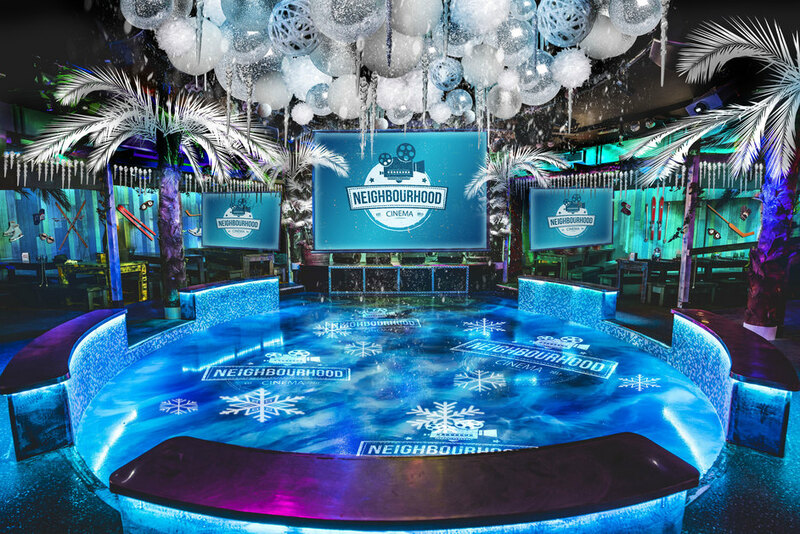 Frozen cocktails will be served from the ice bar along with popcorn and gourmet sliders, and large groups can take shelter in one of the VIP snow cabins, which come complete with a private screen and winter-themed sharer cocktails. There will also be live entertainment and ticketed events throughout November, December and January including a Boxing Day Masquerade Glitterball and a New Year's Eve Snow Ball. What are the best dining options near Neighbourhood Cinema Frozen Island London? Neighbourhood Cinema Frozen Island gyms, sporting activities, health & beauty and fitness. The best pubs near London Neighbourhood Cinema Frozen Island. Neighbourhood Cinema Frozen Island clubs, bars, cabaret nights, casinos and interesting nightlife. Where to have your meeting, conference, exhibition, private dining or training course near Neighbourhood Cinema Frozen Island. From cheap budget places to stay to luxury 5 star suites see our discounts for Tropicana Beach Club hotels, including Thistle Holborn, The Kingsley from 78% off.